Helm is a fantastic tool that eases management of k8s apps. You can define, install and upgrade any application despite its complexity, using Helm Charts. For this tutorial, I’m going to show you how to do deployment using Helm. We’ll be doing the deployment to k8s Minikube, though you can also use GCP cluster. Assumption: You have some k8s skills and setup on your local machine. Confirm installation by typing minikube version. This should give the version installed. Next, start minikube by running this command: minikube start. You can start with a specific k8s version by for example, minikube start — kubernetes-version v1.7.0, which starts a Kubernetes v1.7.0 cluster. Confirm current context is changed to minikube by running kubectl config current-context . If the result is not minikube, runkubectl config set-context minikube . For OSX. you can install via brew by running the command, brew install kubernetes-helm . Initialize Helm by running helm init . We’ll be deploying the default values defined in templates/ folder. 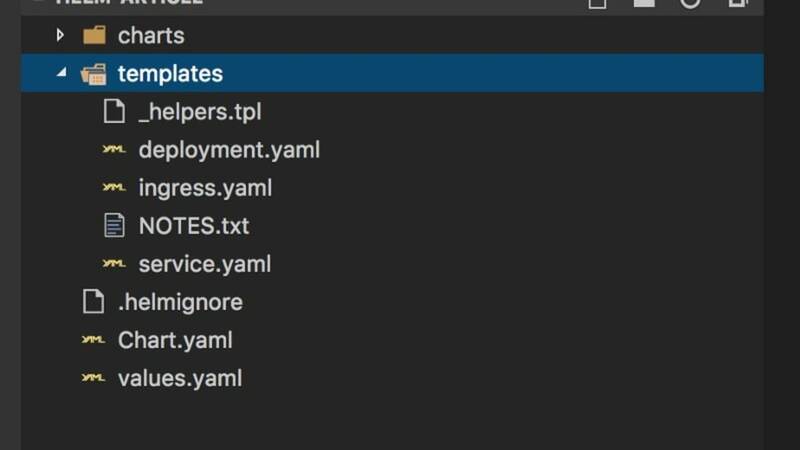 You can as well create valid k8s deployment files inside this folder and carry the deployment using you customized templates. Run helm install . to deploy. To confirm your deployment, you can check the pods by runningkubectl get po or rather by using k8s dashboard(kubectl proxy) and view pods, deployments etc. Finally, to package your chart so that you can share, runhelm package . . This will create a tar package which can be shared. Note: This is not an exhaustive tutorial about Helm. It’s just a beginner’s guide. For a deeper understanding of it please visit the official documentation. Excited to read your comment(s)! A basic introduction to Helm.